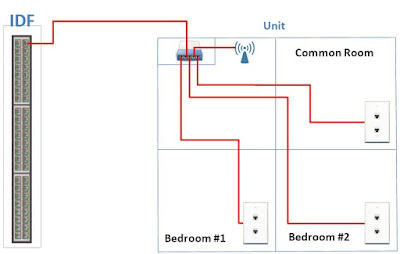 In overview, a media panel is installed in each unit, and category 6 wiring is run from each bedroom and common room jack to that media panel. A single category 6 cable is then run to the closest IDF (wiring closet), usually less than 250-300 feet away as the wire runs. 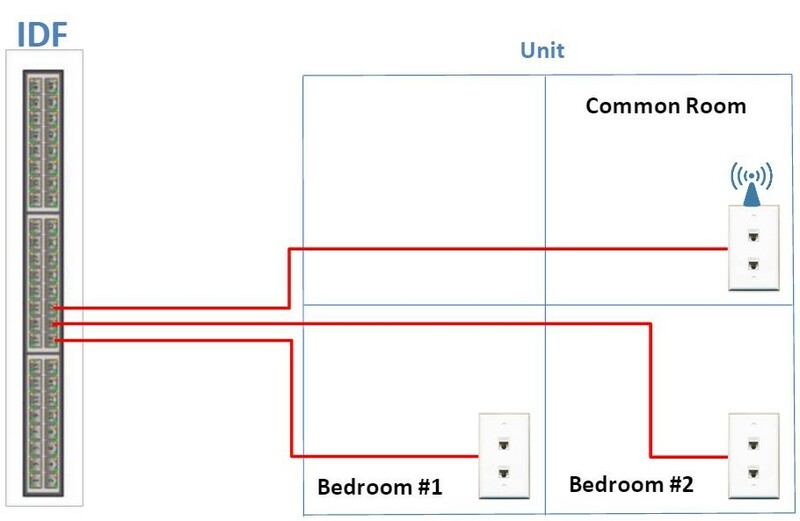 At first glance, it appears that this is a common sense approach for student housing too, after all, it reduces the amount of wire used when compared to a ‘home run’ configuration. That reason alone is why many student housing properties end up being built that way. 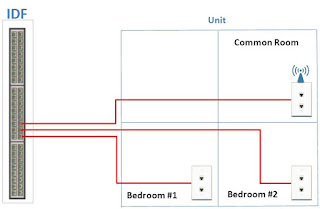 Figure 2 shows the same unit wired using a home run design. 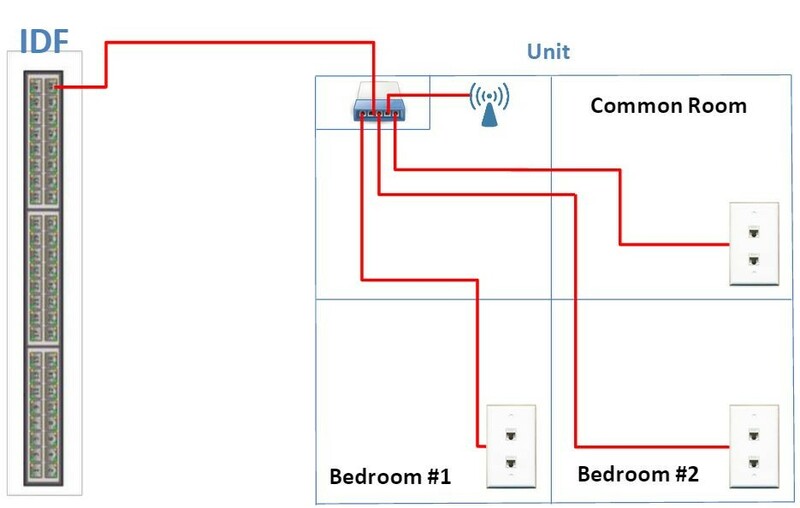 For purpose built student housing, where wired and wireless Internet access is provided as an amenity, the best practice is that all resident jacks should be home run to the IDF as in Figure 2. To explore the reasons why, we’ll need to dive a little deeper. Operational success in student housing internet delivery depends on Reliability, Availability and Serviceability or RAS. In a nutshell, residents expect to always have immediate access to the Internet using any device they wish, whenever they wish. To provide that kind of reliability and availability, the grade of switch hardware that needs to be used has to be carrier or enterprise class. SME or consumer switches won’t cut it at all if you want to maintain high reliability and availability statistics. In addition, all switches need to be managed switches, rather than ‘dumb’ switches, to allow accurate troubleshooting and rapid problem resolution. The reason for mentioning this is that providing 6 ports on a 48-port enterprise grade switch for a 4x4 unit (4 bedroom jacks, 2 common room jacks) is a lot less expensive than providing 6 ports on an individual enterprise grade switch in each bedroom. From a cost perspective, the economics work out in favor of a home run model; the cost of the extra home run cables to the IDF wiring closet is less than the extra electronics cost, the cost of the media panel itself, and providing an extra AC receptacle in the media panel. Power for in-unit WiFi access points can be provided using PoE (Power over Ethernet) from the IDF, removing all need for power to equipment in the unit. In June of 2015, we modeled both scenarios on a live construction project of a new student housing property with a mix of unit types using best practice hardware choices, and compared the cost of various unit configurations using each methodology. The results showed that the construction costs were over $18,000 lower overall by using the home run model. We would stress, however, that cost savings are not the driving factor behind defining the home run model as a student housing best practice – although they help make the argument. The real reason is that the home run model reduces the number of failure points and the likelihood of failure, reducing downtime and increasing resident satisfaction – and satisfied residents are much more likely to renew their leases next year, and tell their friends how great the internet service is at your property. If that is not convincing enough, there are few if any reasons to not adopt the home run model. If, for instance, you were planning on repurposing a property to non-student housing during the life of the wiring, it may make sense to consider alternatives. A note about cable TV wiring: if the property has a category 6 or similar wired Internet infrastructure, the coaxial cable rarely if ever needs to be home run from the wall plate to the IDF. It’s perfectly acceptable to run the coax to a central point in the unit, and connect it using a small passive splitter to a single home run coaxial cable to the IDF.